i was high in alcohol that day. and everything else were in high class except me. warm smiles of manangs greeted me as i avail of my one-way-ticket to the moon, or better yet “to the Sun” since its a warm and humid place where we are headed. hassle lang, yon mga stewardess since its the flag-carrier of an oh-so conservative middle eastern country they are wrapped in humongous “manang” clothes(SEAir pa din ang tunay na 5-star). the plane is wicked. it was damn tight! i can actually live there(trying hard na trying hard lang ah). a very comfy seat complete with pillow and blanket and an lcd screen where you can watch, listen and play(parang kape lang, 3-in-1). the media player really was the shiznit. very comprehensive database of films and music; from Casablanca to Godfather; from The Beatles to The Killers. it has a good variety of movies. even some new ones were there. even tv series, foreign films and indies(may Southpark pa, san ka pa!). and also some National Geography features. and then the food. 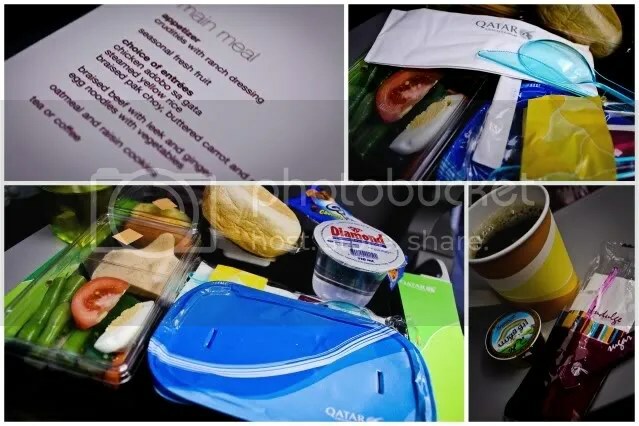 who ever said airplane food is crap probably had not taken a Qatar Airway flight yet. for lunch they served a 5-course meal starting off with Crudities with ranch dressing for appetizer( di ba pangalan pa lang pang mayaman na. hehe) and for the entrees Braised Beef with leeks and ginger in Egg Noodles and Vegetables( sosyal, ang haba ng pangalan). theres also seasonal fresh fruits, oatmeal and raisin cookies and hot tea. plus unlimited red and white wines, sodas and juices through out the 8-hour flight. ginger ale was good( salabat lang pala. haha). and charan! unlimited beer… Heineken! if only i wasnt having a bad case of hangover that time. for the second meal i had “Chicken in chili and coriander sauce with mixed oriental vegetables”. sounds good huh. so even if i despise corriander, all for the spirit of luxury, i finished it all… honestly, it didnt taste that good though. its around 3pm in Doha when we touched down and the indulgence just kept on rolling. then i was ushered to a BMW limousine complete with a chauffeur in coat-and-tie fashion. ofcourse i sitted at the back of the driver(haha parang bosing na bosing lang). the interior of the car was in auburn leather. then off we went to the posh 4 Seasons Hotel in Corniche drive. later that night i arrive in my room complete with complementary fruits laid on my bed, water etc. plus towels and soap. just like a hotel room. it was a day just brimming with luxe and oppulence. unfortunately i had to end my day of indulgence early, as work started early the next day. and just like that the table had turn. now i work like a dog… but thats another story. Bongga to the Nth level! The facade of the hotel resembles the one I worked for in U.A.E.! This is really funny particularly the Four-Season-sosyal-way!! This is probably how we’d react too, given all the sosh stuff HAHA! 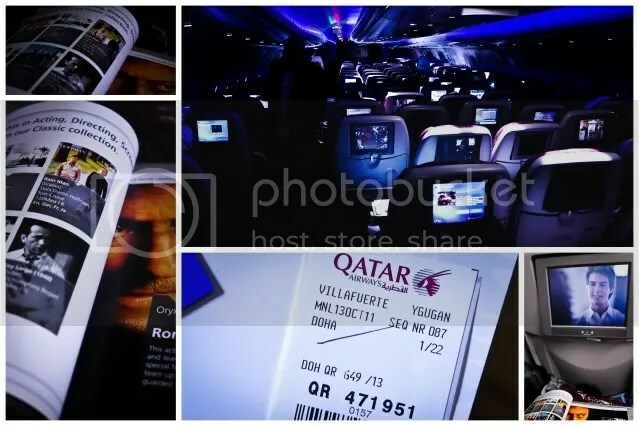 I also dream of riding a first class airline like QR – even in economy class everything seems luxurious but if given a chance to be in their First Class, why I not? I won’t hesitate to fly with QR!